Make yourself at home in this stately brick 4 bedroom, 2 1/2 bath home in Hammondsport. Liberty Park Manor was built in 1887 and has maintains many of its gorgeous old details with all the added modern conveniences. The house is just a short walk--1 block--from both the Keuka Lake waterfront and also downtown Hammondsport and the square. The house is situated in a very quiet and historic neighborhood, with Liberty Park directly across the street from the house...a perfect spot to let the kids play a game of frisbee or run. Liberty Park Manor has a small yard, lovely flower gardens and a private, fenced patio to relax, eat dinner al fresco, and grill. 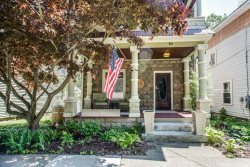 The wrap-around front porch is perfect for having a glass of wine and listening to the sounds of small-town Hammondsport or waving hello to the neighbors. There is also a small, fenced, backyard deck with a bistro set for enjoying a cup of coffee in the morning as the sun comes up. The Living Room is large and opens into the Dining room as well as the kitchen. The Living Room looks out over the front yard and the street. In the kitchen you'll find a small eat-in breakfast area as well as a bar to sit up to. The kitchen is fully stocked with dinnerware and cookware. The Dining Room has a large table and chairs for dining or sitting to converse and you'll find a outside patio door that opens onto the small back deck with the bistro table for two. From the Dining Room, you'll find a hall way that leads to the wine room and the first floor full bath. The wine room has a small table with comfortable chairs and is the perfect spot for a game of cards and a drink. The wine room also has an outside door that leads onto the large backyard patio and the outdoor dining set as well as the grill. At the end of the hallway is the first floor full bath with a large soaking tub and a walk-in shower as well as the closet with the laundry area and washer/dryer. Off the one side of the Living Room, you will find Bedroom #1, the Red Room. This room has a Double bed, looks out over the front of the house and the street and also has an attached half bathroom. Also off of the Living Room, you'll find the Main staircase and hallway that lead to the upstairs. Bedroom #2 is at the top of the stairs and to your right. This bedroom is quite spacious and has a Queen size bed and a view out over the front of the house and the street. Bedroom 2 also has an attached, screened in balcony with a small bistro set for two that looks over the street and the surrounding neighborhood. Also located off of the Main staircase and hallway is Bedroom #3. This room looks over the side street and has a Queen bed and a Twin bed. Going through this bedroom, you'll find a doorway leading into the Game Room. A perfect room for card games, kids play area, etc. The game room can also be reached by an adjacent hallway. From the Game Room, you'll go along the back hallway, past the back stairway, and find the second full bath. This bathroom has a walk-in shower. The hallway also extends back to the front of the house and Bedroom #4 as well as Bedroom #2, and has a second set of stairs that go down to the main floor. Bedroom #4 has a view of the front of the house and the street as well as looks out over the side patio area. This bedroom has a Double bed. We hope you'll fall in love with Liberty Park Manor as much as we have and will enjoy the quiet, small town life of Hammondsport. There are shops and eateries to be explored just around the corner from the house. You can also walk to one of our favorite little grocery stores, Hammondsport Grocery, located just off the town square. Keuka Lake is a block away as well the lakefront park and kayak rentals. Hammondsport has been voted the 'Coolest Small Town in America', and we think you'll find it is an amazing place to get away and explore the Finger Lakes from. Linens Included. Beach towels not included. Joleen was very easy to deal with. She had all of our information to us when she said she was going to. Everything was in order and our booking for this property was very easy and smooth. The property was very clean and in a great location. We were able to walk to shops, restaurants, and the lake. We enjoyed our stay and will definitely rebook again. Overall the house was the perfect size for the 8 of us. It was in immaculate condition and was everything we wanted in a vacation setting. A short 2 minute walk to beautiful Keuka Lake and in the heart of Hammondsport, NY, a quaint town on the south end of the lake. The house was easy to find, however we arrived after dark and one suggestion may be to install motion sersor lights on the porch, so that accessing the keylock would be easier. Once in the house, we were amazed at the size and the condition. The kitchen was fully functional and modern, with all the pots, pans, plates, glassware and utensils provided. The Living area and bedrooms were up to date and spacious, and the outdoor porch and patio w/grill were a great feature. The surrounding neighborhood was quiet, friendly and safe. All in all, it was a great place and we look forward to booking there again in the future!! *Check in is 4:00 P.M. Check out at 10:00 A.M. Check in and Check out times MUST BE PROMPT unless arrangements are made otherwise with the reservationist. *Reservation hold payment is 50% of the reservation amount, due at the time of reservation. Payment due in full 30 days before check in. *Required fees include the processing fee and our hospitality fee. The hospitality fee covers all linens for the beds, one set of towels/washcloths per guest up to the maximum occupancy, and toiletries for your stay as well as cleaning service and laundry service for after your departure. All beds will be outfitted with linens before you arrive. Beach towels not included.